★ HIGH QUALITY STAINLESS STEEL, LONG DURABILITY – 3 QUART ★ It is designed with the highest quality stainless steel and aluminum, which promotes long durability and fast cleaning. 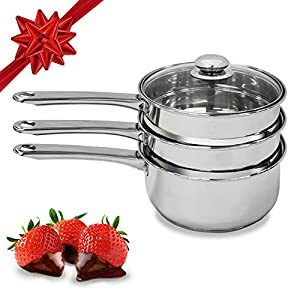 Our double boiler come with riveted ergonomic handles for comfort and strength! ★ CLEAR VIEW WHILE COOKING, NO MORE BURNED FOOD ★ Our 3 Qts double boiler comes with a tempered glass lid, providing a clear view while cooking. It also comes with vent holes to help release excess moisture, keeping the lid CLEAR and CLEAN. Perfect for all your double boiling and steaming needs.